Amy’s portraits aim to capture moments in time, memories, reflections and the expression of various emotions. The portraits try to actively involve the viewer and remind the viewer of similar times and emotions which they have experienced in their own lives. The angles, the heavy application of the paint and visible brush strokes add power and allow a personal interpretation. 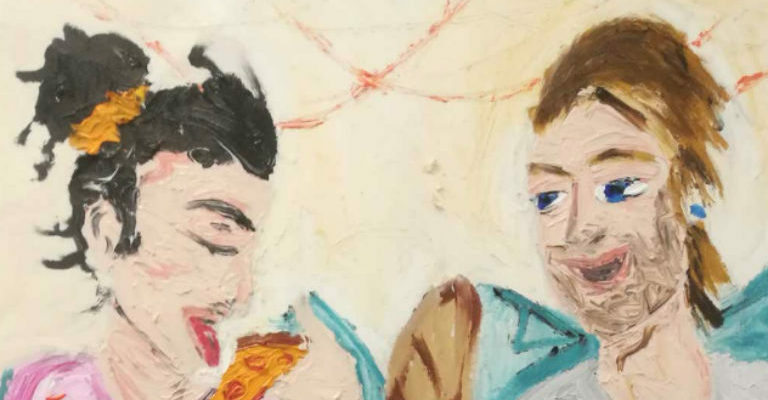 The subjects’ features are slightly distorted, the artist is concerned with capturing the real person, the inner soul, not simply being physically accurate. Bold, strong colours sometimes blend and on other occasions clash. The “donated objects” such as the jewellery and sunglasses within the portraits go further to capturing the real person, and create the feeling through these objects, that the person has actually contributed to the portrait. An area of particular interest is her ability to create the same effects in portraits of very different sizes, from large scale to miniature portraits. Amy is a local artist based in Sunderland. She is a graduate of Sunderland University where she studied Fine Art obtaining a First in her BA and has just completed an MA.